Thanks for posting the Zapruder frame, because in it you can see the subtle, dark horizontal stripes in Gloria "Real Deal" Calvery's greenish-colored skirt, which stripes or bars can also be discerned in the "sliver" of her skirt that's visible in frames from Couch-Darnell, if you know where to look for it (the "sliver" of skirt, that is) and enlarge a good quality copy of the frame properly. PS As regards the black-and-white Darnell frame, above, the 3-second clip it came from can be watched at the very end of the video that Dennis Morissette posted on another thread. After clicking on the "link," scroll up to find the video. I've been wrong before on ID-ing people in this damn case, but I'm going to say that the 3 girls in the Z frame and then seen in the BW still are the same people. If you look at the hair in both and even clothing texture in both, it really does look the like the same people. Graves has absolutely NO evidence that could possibly substantiate his fevered allegation! He must have a serious case of the DTs, or be dosing on LSD, or something! Or maybe he's off his "meds," AGAIN ! Since Karen Westbrook has positively identified two of the women she was with (big, tall and very dark-red-haired Gloria Calvery and ... uh ... herself) in the Zapruder film (albeit from behind and 54 years after-the-fact), there were obviously TWO three-woman groups down there on Elm Street during the motorcade, and it's shear rotten-bad luck that both were not caught at the same time in any of the many photographs and films that were taken that day! And it's shear COINCIDENCE that both of those groups had a woman who was wearing a light-colored headscarf, and it's shear COINCIDENCE that both groups had a woman with medium-dark hair in the middle, and it's shear COINCIDENCE that both groups had a woman with a dark Hispanic or American Indian-like complexion AND poofed-up black hair, and it's shear COINCIDENCE that in both of those groups the three women were about the same height, and it's shear COINCIDENCE that the clothes worn in each of those groups was mirror-imaged by the clothes the gals in the other group were wearing, at least from the chest up! I could go on and on and on, but suffice it to say that Graves is attempting to do some SERIOUS DAMAGE to our honest and rigorous JFK assassination investigation, damage that could take DECADES to fix if he's successful! I mean, I mean, I mean ... where's Thierry "Fake News" Speth when we really need him? 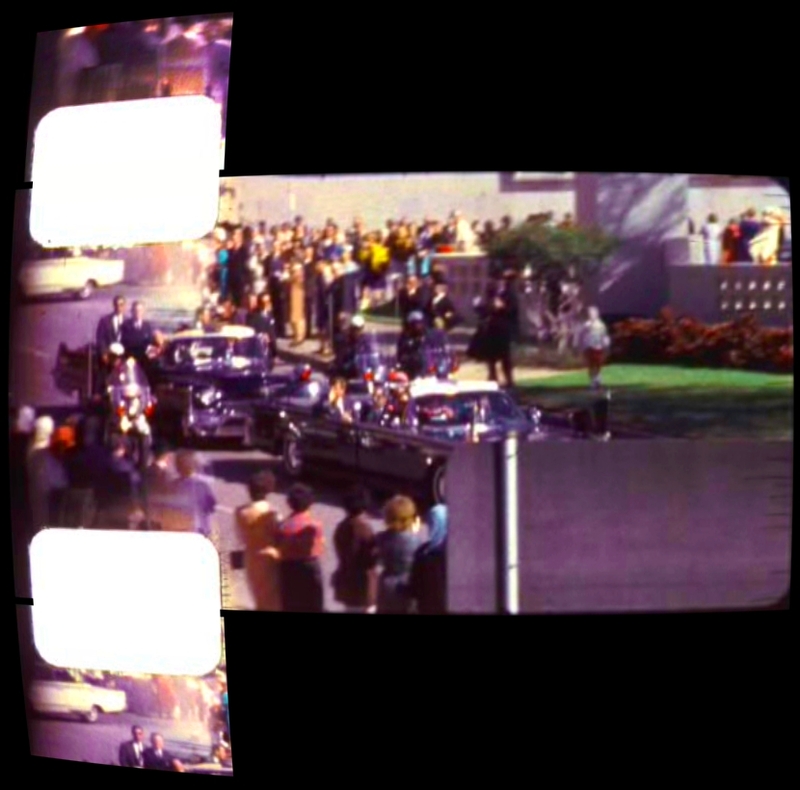 are standing almost directly between Zapruder's camera and Hugh Betzner on his (south) side of Elm Street (by the reflecting pool or fountain, or whatever it's called by the near hairpin curve at Elm and Houston). Betzner's the guy In ZFrame-187 who's dressed in light-colored clothing and holding a camera in front of his face, to the right of the person dressed in shiny blue. It tells us that the three women "down there by the Stemmons sign" in black-and-white Betzner-3 are the same three women in Zapruder about whom we've been arguing for a couple of years now as to whether or not one of them might be Gloria Calvery. So, now that we've established that, if we're Bart Larry Grayson doppleganger Bart " Ooooh...Shut That Door" Kamp or John Iacoletti, we've got to ask ourselves, "Where is that other three-woman group, darn it? You know, the one that also has a woman wearing a light-colored headscarf? I sure as heck can't find it in that panoramic Bronson-5 photo." The light blue scarf on the one girl in Z matches light blue in the above. Thanks for posting that panoramic Bronson image, Michael. EDIT: When I first viewed Bronson imague you posted on my android, I could "scroll" the image "off screen" left and right, but can't do that on my laptop. Can you? For purposes of correlating the above photo with the Zapruder Film and Don Roberdeau's map, etc, please note not only Umbrella Man and Dark Complected Man (and Babushka Lady on the near side), et al., down the street, but that going the other direction we can spy hat-and-suit-wearing Ernest Brandt standing directly above the end of the limo (and John Templin, to our right, next to him), and at the far right edge of the frame -- "Woman All In White". Yes, I can see a pattern in the skirt of the woman in Zapruder who may or may not be Calvery. Tommy thinks that sarcasm is evidence, but unfortunately for Tommy, he doesn’t actually know that the three Darnell women stood in a “three woman group” on Elm street, nor does he even know that Holt, Simmons, and Jacob stood in a “three woman group” on Elm street. Nor does he know how tall any of them were. Yes, and I’m sure you will. What's gotten into you, John?